If you’re an ultrarunning superfan, you’re probably not just following Western States, but also the spring racing season that leads up to Westerns (and determines some of its top entrants). So here’s a quick viewer’s guide to the five most competitive trail ultras in March and April, and the top runners to watch at each. This northern California race typically attracts a strong field of speedsters from the Bay Area and elsewhere. Roche isn’t in the starting lineup this year, but the top three finishers from 2015 will be: Patrick Smyth (first in a course-record 3:04), Ryan Bak (second, 3:10) and Tim Tollefson (third, 3:20). Other contenders include Paddy O’Leary, Chris Denucci and Chris Mocko (all top-10 finishers in 2016) as well as possible dark horse, 25-year-old Scott Trummer. As a rookie last year, he led the highly competitive 2016 Tampalpa Headlands 50K for a while before eventually finishing fourth. Rematch! Last year, Megan Roche beat out YiOu Wang by less than a minute; a year earlier, Roche was first and Wang third. Between the two of them, they hold four of the race’s six fastest times. Both are signed up this year, though after her recent win at the USATF Trail 50K Championships, Wang told Ultra Runner Podcast that she was still deciding between this and Chuckanut. If she does return, it could make for an exciting battle. Amy Leedham and Caitlin Roake both finished top-10 last year; Keely Henninger was eighth at The North Face 50-mile and fourth at the Chuckanut 50K last year. 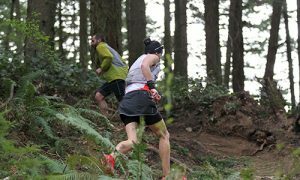 A Northwestern classic that typically draws a solid field, Chuckanut may be even more competitive this year, due to its status as the qualifier for both the American and Canadian World 50K Championship teams. The lollipop course starts and ends with a relatively flat 10K, but the middle 30K throws in 5,000 feet of climbing—meaning opportunities for marathon speedsters and mountain goats alike. “It kind of plays to either strength,” says race director Krissy Moehl. “But I want to say, if you’re gonna stereotype, it’s usually been the mountain runners that have prevailed. The big names at Chuckanut are David Laney, Sage Canaday and Hayden Hawks. Laney has two wins and a second-place finish at Chuckanut; Canaday has also finished second there, in 2012. Hawks has never run Chuckanut, but he ran a stellar 5:58 at The North Face 50 in December, for second place, just two minutes behind Zach Miller. A handful of Wisconsinites could also make things interesting. Michael Borst has notched 16 wins at upper-Midwest events like the Voyageur and Superior Fall Trail Race 50-milers and the Zumbro Endurance Run 100-miler. Did we mention he’s only 23? Jake Hegge, 25, also has a number of wins and strong finishes at some of those same Midwestern races. And Tyler Sigl, 31, won the Cayuga Trails 50 (the USATF 50-mile Championship) in 2016. If she races, YiOu Wang (see above) is a likely frontrunner. But two speedy Washington State runners—Ladia Albertson-Junkans and Maria Dalzot, a Bellingham local—will make their ultra debuts at Chuckanut. Both have excelled at trail and mountain races around the half-marathon distance. Returning top-10 finishers include Anne-Marie Madden (second in 2016, fourth in 2015), Sarah Bard (third in 2016; also a two-time winner of the JFK 50 mile) and Melanie Bos (most recently third in 2014). This East-Coast race doesn’t attract as many big names as some others on this list. But as one of six opportunities for elite runners to win a “Golden Ticket”—automatic entry into June’s coveted Western States Endurance Run, granted to the top two males and females—it’s one we’ll be watching. The course starts off with what race director Sean Blanton calls “Satan’s rollercoaster”— 38 miles of relentless up and down along a ridgeline, for a total of 12,000 feet of climbing with maybe five switchbacks. Then, there’s an eight-mile runnable stretch before another hilly section at the end. Andrew Miller, the winner in 2015 and 2016 (and 2016 Western States champ) has a good shot at defending his title. But David Kilgore and Kyle Boykin could also challenge for the lead. Kilgore, a 2:28 marathoner from Florida, led much of the 2015 Death Race before eventually dropping. 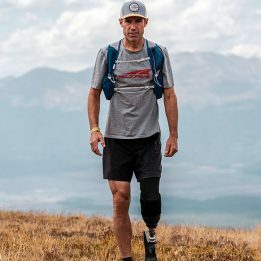 Boykin, from Georgia, set a course record at the 2016 Cruel Jewel 50-mile, which incorporates some of the same trails as the Death Race. 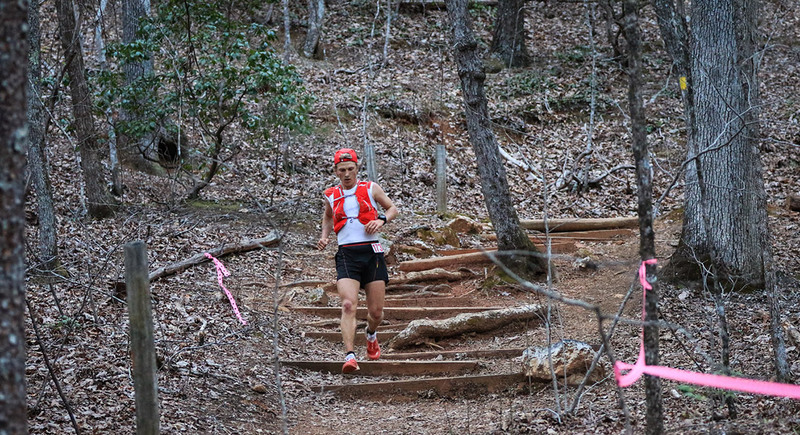 Blanton has one name for you: Jacky Merritt, a recent transplant to Atlanta, who has “been just crushing” area trail races, including a course-record win—19:04—at the rugged Pinhoti 100 in Alabama. Another Golden Ticket race, Gorge Waterfalls takes place in Oregon’s Columbia River Gorge. With 12,000 feet of total elevation gain, it’s got some big climbs but should be fairly runnable for elites. The on-fire Jim Walmsley recently said he would try for “14 flat” at Western States—46 minutes faster than the current course record. Barring some mishap, Gorge Waterfalls should be his ticket to get there. “Walmsley has been so good that even though he’s not even qualified [for Western States] yet, no one is questioning whether he’ll earn his entry,” says Justin Mock, who writes iRunFar’s “This Week In Running” column. David Laney and Australia-based ultrarunner Vlad Ixel—who won the 2014 North Face 100K Thailand in a strong 8:34—look like strong podium contenders. Another runner to watch may be Joe McConaughy. 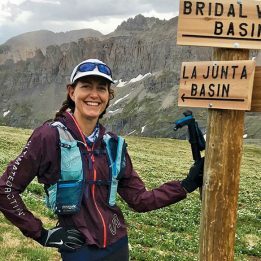 Though relatively new to ultra racing, the former Boston College track athlete set the (since broken) Pacific Crest Trail speed record in 2014. With no big names registered so far, the women’s race is wide open. 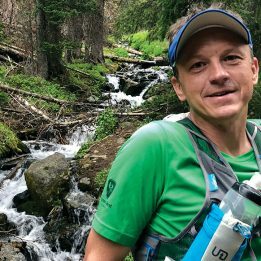 It does include a number of runners who’ve done well at less-competitive ultras, like Paige Pattillo (outright winner of the 2016 Mount Hood 50K in a speedy 3:50), Kandy Ferris (winner of the 2015 Georgia Death Race), Kim Magnus (first at 2014 Squamish 50-miler), Emily Kalenius (first at 2017 Sean O’Brien 50K) and others. Set in lovely northern California (here’s an awesome photo gallery), Lake Sonoma is the biggest showdown of the spring season—and the final Golden Ticket race. Speed indeed. Patrick Smyth, a 2:15 marathoner with a couple 50Ks under his belt, will be running his first 50-miler. Ryan Bak (a 2:14 marathoner, and second at Sonoma in 2015), along with past winners Sage Canaday and Dakota Jones, should make it a race to watch. Chris Mocko (seventh at Western States in 2016) could also be in the mix. The women’s field is insanely deep this year. There’s last year’s winner, YiOu Wang; the last two winners of Western States, Kaci Lickteig and Magdalena Boulet; and Camille Herron, the 2015 World 100K and 50K champion (on roads), who finished fourth at Lake Sonoma last year in her first race on trails. Others gunning for one of two Golden Tickets could include Courtney Dauwalter, who won the Run Rabbit Run 100 in September, then bested the men’s course record at the Javelina 100K in October; Alissa St Laurent, second at Run Rabbit and fifth at Western States in 2016; Anna Mae Flynn, third at Lake Sonoma in 2016; and Sabrina Little, three-time winner of the Rocky Raccoon 100. Don’t neglect the masters’ race, either; veteran ultrarunners Meghan Arbogast, Pam Smith and Anita Ortiz are all slated to start.